I personally think graywater systems are fantastic and genius. Really, why do we need to use potable (treated, drinkable) water to flush our toilets anyway. Basically, graywater systems utilize the water that has already come out of your faucet for other functions around the house. You've already paid for it so why not use it as much as you can. There are many different graywater systems out there so you would need to find one that best fits your lifestyle and home design. 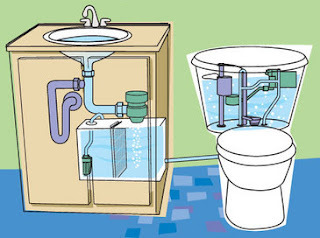 The system that I like uses the water that runs down your bathroom sink to refill your toilet. The best way to learn about graywater is to check out some interesting facts at www.graywater.net. There is a great list of questions and answers, general information, benefits, and some other good stuff.